Jordan Times - This is a well researched and well written book by Princess Basma bint Talal about her long and extensive experience with the social development sector in Jordan. For more than twenty-six years the author has been Chairperson of the Jordanian Hashemite Fund for Human Development (JOHUD), one of the longest serving non-governmental-organizations (NGOs) working nationally in Jordan and definitely one of the most effective. 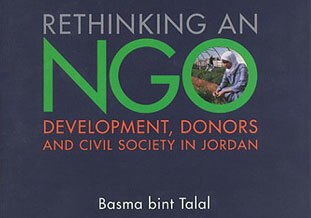 In this book Princess Basma gives her insight about the role of NGOs within civil society and Jordan’s course of development, with emphasis on addressing the needs of vulnerable groups, particularly women. The book also provides a studied account of international development literature and practices, the way they apply to Jordan, and the lessons and experiences to be drawn. Literature on civil society in Jordan including NGOs is limited and few books have been written by Jordanians on this subject, particularly in English. Correspondingly, this book is a valuable addition to the literature on social development and the development process in Jordan, as well as the growing and changing roles of civil society and NGOs. The book is in two major parts. Part I examines the various phases in international development policy since the Bretton Woods assembly in 1944, and their effect on the development process in Jordan. It consists of two chapters which will be of great benefit to readers inside Jordan, as well as to researchers from outside the country. In the first chapter the author highlights the shifts in development paradigms by international donors during the second half of the last century. I consider Chapter Two to be probably the most important chapter in this book. It vividly depicts the social, economic and political development of the Kingdom since its inception in 1946 up to 1999. It traces the process of that development over four distinct periods: the 1950s – 1960s, the 1960s – 1973, 1973 to the end of the 1980s and 1990 – 1999. I think that anyone interested in Jordan′s affairs will find this chapter rich in material, which does not merely offer an introduction to the country, but moreover a critical evaluation of how the country had to adapt to varying local as well as external circumstances. Hence, the underlying factors, political, social and economic, and their specific impact during these periods on different sectors of both state and society, form the focus of the author’s analysis. Part II of the book is mainly concerned with the establishment and growth of the Queen Alia Fund (QAF), a leading NGO working at the national level since 1977, and renamed the Jordanian Hashemite Fund for Human Development (JOHUD) in 1999. This part offers a detailed examination of numerous development issues through the experience of the Fund. The author analyses the Fund’s approach and initiatives within the social sector since its inception. Picking up on the themes highlighted in Part I, the book demonstrates how the evolution of QAF, and later JOHUD, "mirror the stages of development of Jordan, and serve to illustrate the ways in which dependence on international donor funding required all the actors engaged in furthering the development process (that is, the state and NGOs) to constantly respond to changes in the external environment, over which they often had little control." Also of interest at the beginning of Part II, is an informative and detailed description of the author’s research methodology. Drawing mainly on the actor-oriented approach as set out by social anthropologist Norman Long, this framework for research assumes that theoretical and pragmatic issues and initiatives are ‘so closely interwoven that one cannot have one without the other’. Thus the methodology adopted by Princess Basma emphasizes “recognizing the multiple realities and diverse social practices of different actors and requires working out methodologically how to get to grips with these different and often incompatible social worlds”. For as she maintains, “different elements of this approach are particularly suited to an examination of the diverse, often complex and paradoxical factors underlying Jordan’s course of development”. Focusing on the growth of the Fund up to 1999, the book discusses different problems encountered by the organization during this process, and the approaches and strategies it adopted to deal with them. It highlights a major achievement of the Fund, the initiation of a network of Community Development Centres (CDCs), reaching fifty in number operating throughout the country by the year 2000. A wide range of themes from gender and development, donor conditionality, microfinance to participation are weaved into the arguments raised by the author in Part II, as she discusses the operations of the Fund’s CDCs network, as well as the role of the Queen Zein al Sharaf Institute for Training and Development (ZENID). Within this context, the role of ZENID is identified with the process of internal reform begun by the Fund in the latter half of the 1990s, and analysis centres on issues of best practice, decentralization and the advancement of the Fund’s strategic objectives, particularly in relation to human capacity-building. It is not possible within the confines of this short review to pay justice to this remarkable book. I just hope that it will be soon translated to Arabic, to enable wider readership and larger audience to benefit from Princess Basma’s valuable experience.